Trophies can be a brag-worthy element for any birthday party, community picnic, talent show or kids' game night, but that doesn't mean they need to be expensive or tacky. Making half a dozen trophies took less than an hour and cost no more than $20. 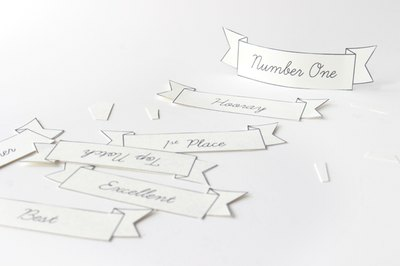 Guests will leave impressed and excited to display these simple, clever and modern trophies. 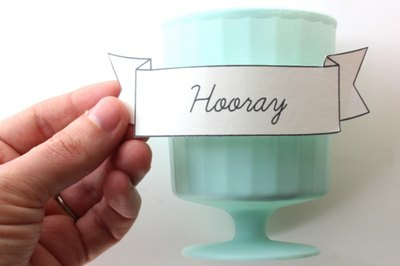 Tips: Visit the dollar store to find a variety of affordable cups and plates as well as small toys, animals, figurines, etc. Use gold spray paint for a classic look or a fun color or two for a more modern look. 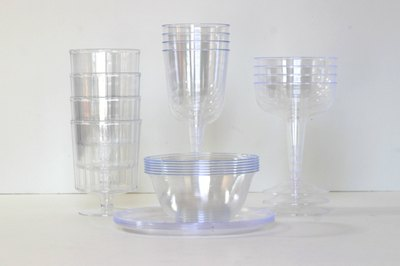 Stack and glue plastic bowls, plates and cups together to create pedestals for the trophies of varying heights and sizes. 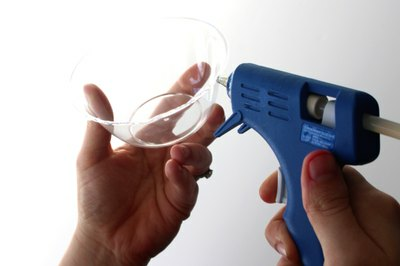 Place hot glue on the rim of either a bowl, plate or cup and top with a second piece to create a pedestal for an animal or object. Repeat this process to create as many trophy pedestals as you'd like. 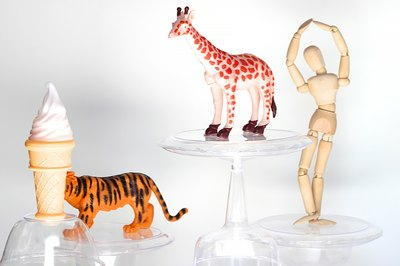 Next, stack and glue toys, animals, objects or figurines on top of the pedestals to make a variety of interesting and unique trophies. Get creative by using unexpected pieces. Make sure to work quickly with the hot glue. 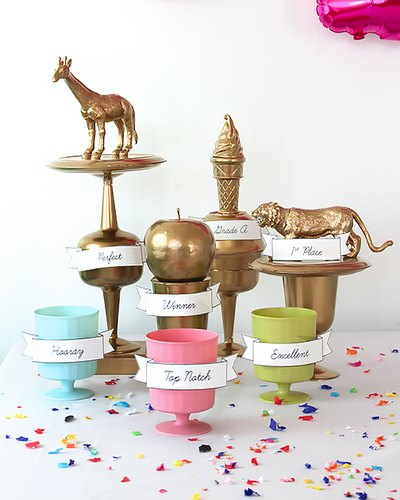 Spray paint the pedestal trophies in a solid color such as gold or a colorful matte finish. 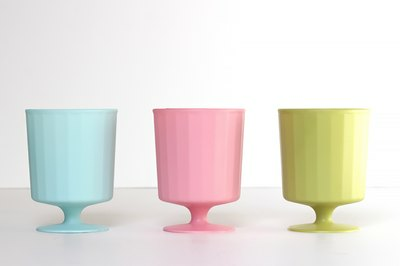 You could also spray paint single footed cups for simpler trophies like those pictured. Be sure to spray paint either outdoors or in a well-ventilated area. Place the trophy in an old cardboard box or on a tarp, hold the paint can about a foot away and move in smooth strokes as you spray for an even finish. Wait at least 20 minutes in between coats to avoid paint drips. Download and print these free ribbons onto card stock. Cut them out and gently bend them around a finger or pencil to create a little curve. 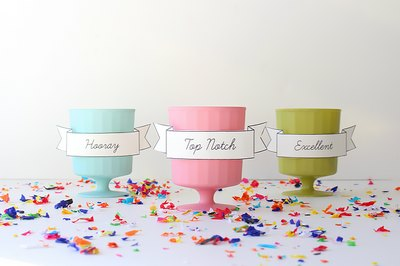 Attach ribbons to the trophies with either a piece of rolled tape or a dab of hot glue in the center to finish the look. You can customize each trophy's color, size and shape, giving you the ability to personalize them for any type of event and for all kinds of winners and champs. Hand out each trophy and practice acceptance speeches because with these customized awards, everyone wins! Each trophy was passed out to celebrate a "Hi Five" birthday party.